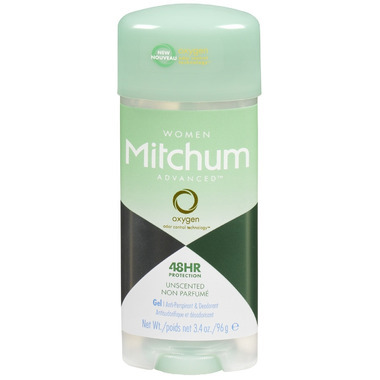 Mitchum Women Advanced Gel is an advanced strength antiperspirant / deodorant with Oxygen Odor Control Technology. This exclusive Mitchum formula releases pure oxygen, a powerful odor fighter, to help eliminate odor caused by bacteria. It gives you maximum wetness protection with the highest level of active ingredients for 48 hour protection. Excellent deodorant. It will even last a few days without reapplying! Mitchum gel is the worst product I have ever used, stays wet, is sticky and heaven knows when it will dry if ever, must wash off. I've been trying to find something to replace Dove's sensitive unfragranced anti-perspirant/deodorant (since they changed that formula) , and thought this would be a good one to try. It works beautifully but ONLY once it dries; and oh my goodness it does take a lot of time to dry. Have even resorted to using the blow dryer to speed up the process but even then... So for me it works great but the gel formula's initial wetness is a time-wasting deal-breaker. Hopefully the stick will be offered in unscented soon.